Many of you know that on March 10, 2010 Iowa changed the definition of beers over 5% ABW from ‘Liquor’ to ‘Beer’. Iowa brewers will now be able to brew and sell high proof beers. Governor Culver signed SF 2088 which included a provision that put all beer up to 15% ABV in the hands of beer distributors. This opens up the market to hundreds of new brands and products and allows Iowa microbreweries to brew a wider variety of styles that traditionally contain more alcohol. As a result of this Millstream Brewery will be brewing our first high proof beer next week! We will be making a Weizen Bock which is a dark unfiltered wheat beer. The alcohol content will be about 8+%. We will be kegging most of the beer, but hopefully a limited quantity will be available in 22 oz. bombers in some stores and at the brewery. Should be available around the first of June. We hope to bring out 4 different high proof beers this year and let our customers choose which one we will go into actual production with. Join us at Millstream this year as we celebrate 25 years of brewing beer! We have brewed a special anniversay Dopple Bock beer that will be released May 1st at the brewery. It celebrates our anniversary and our new high proof law change and runs about 7% ABV. Millstream has been selected by KCRG as an A List business. Go to KCRG.com and vote for us. KCRG.com – A List – Nightlife – Beer selection. Thanks to all who support us! Short’s of Iowa City is doing an Iowa Craft Brewers Dinner Series. 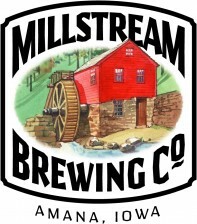 A 5 course dinner will be paired with the Millstream beers. $35 (includes dinner, gratuity and tax) and can be purchased at Shorts or online at johnsgrocery.com. Talk with Brew master Chris Priebe and Chef Kevin Periz during the dinner. Millstream will be sampling out our beers at this event. The event sponsors the Junior Achievement Of Eastern Iowa. It is located at the Isle Casino Hotel Ballroom in Waterloo. Millstream will be releasing our 25th Anniversary beer during our Maifest celebration! Brewery tours on May 2nd at 11 am & 1 pm. Check out www.festivalsinamana.com for the complete listing of the Maifest event. Join Millstream Brewery as we are part of their beer festival benefiting the American Heart Association. 75 brews from all over the world and live music will be enjoyed by all for only $15. Go to www.benzbeveragedepot.com and click on their upcoming events tab to find out more information.